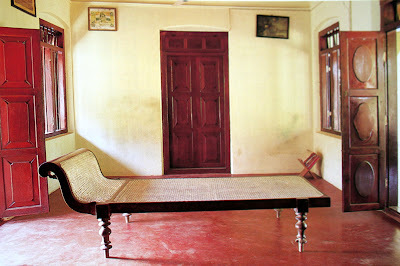 Kalari Kovilakom or the Palace for Ayurveda is located in the old princely capital town of Kollengode in the foothills of the Annamalai range, Kerala, India. 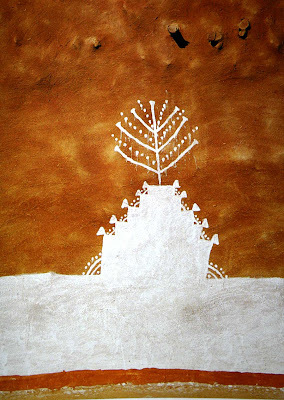 Today it has been restored by the CGH Earth Group into an unique experience of wellness. 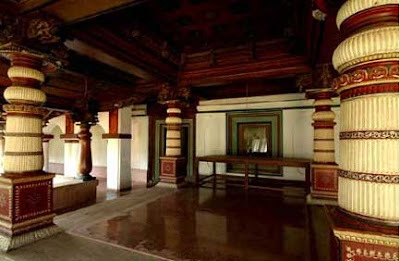 The palace has two main wings the Old Guest Wing with old colonial western styled rooms & Palace Wing which has traditional Kerala architecture. 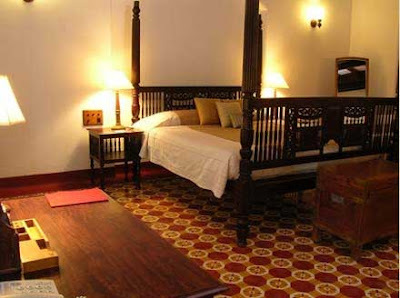 A typical room in the Old Guest wing, a section of the palace built specially for visiting European visitors and see the lovely four poster beds and 30's style floor tiles. 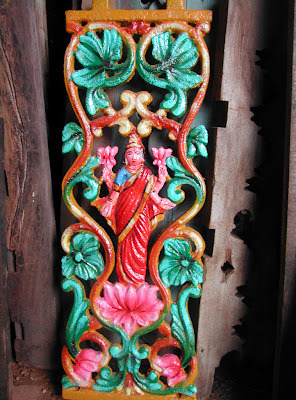 Amazing carved wooden panels on the ceiling with vegetable dyes. 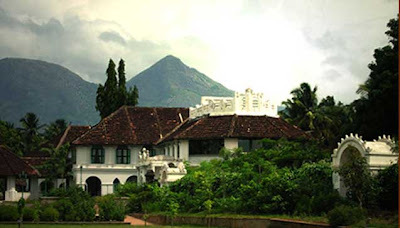 Kalari Kovilakom with beautiful hills in the background. 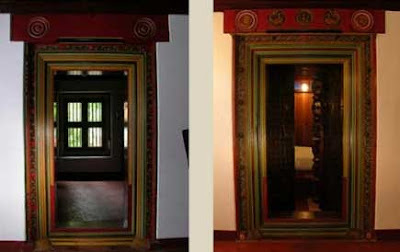 The empty spaces have been converted into beautiful bedrooms retaining the charm of carved doorways. 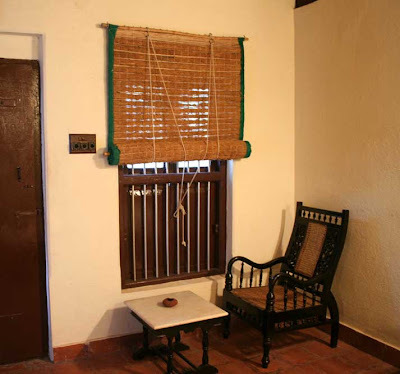 Go in for the ayurvedic experience, learn yoga or Kalaripayattu, de-stress with many herbal massages, eat simple & healthy food prepared in the ayurvedic kitchen. 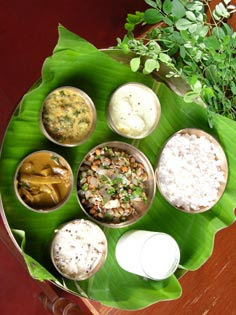 Start planning your next 'Ayurvedic Holiday' soon. 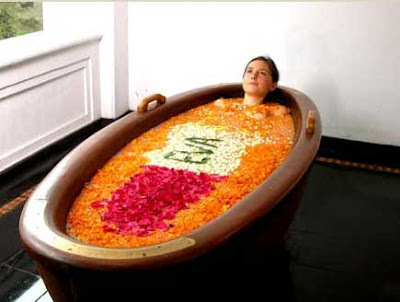 De-stress, rejuvenate, relax and forget about your worldly worries while you are treated like royalties in the Palace of Ayurveda. 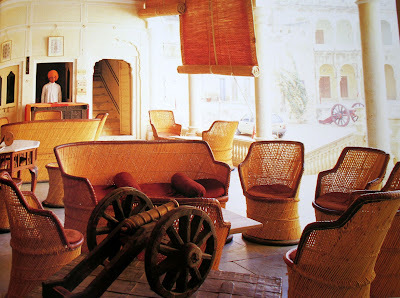 and let me show you some interesting seating ideas from Incredible India... 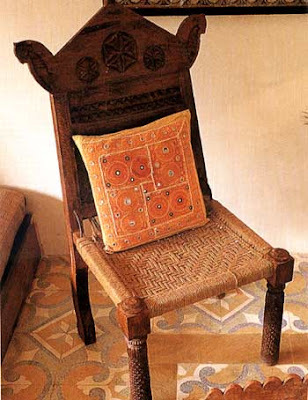 Beautifully carved Shekawati chairs from Rajasthan teamed with colourful embroidery cushions. 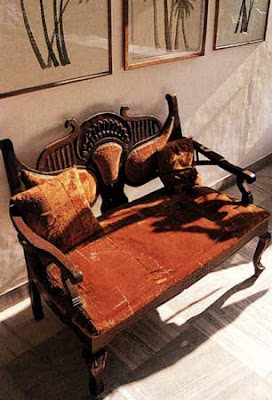 The planter's chair or the easy chair is my all-time favourite. 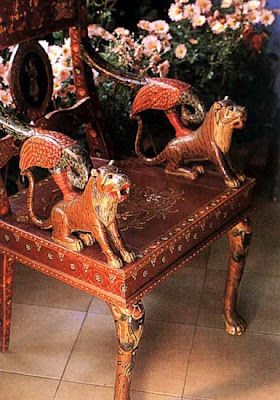 How can you not relax your tired torso on the curve of this piece of art & prop your legs on the arm rests? 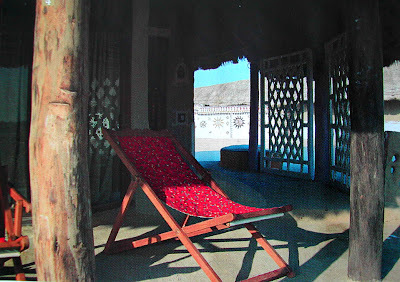 A folding easy chair with colourful fabric for those hot sultry days. 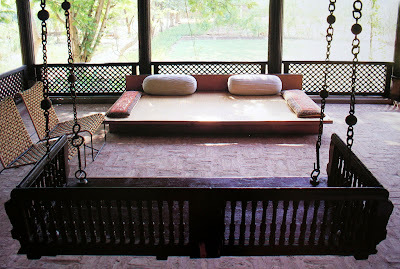 The cool swings, jhoolas or hichkars from Gujarat. 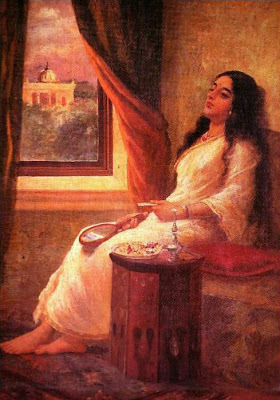 The to and fro motion of the swing can put anyone into a state of bliss. 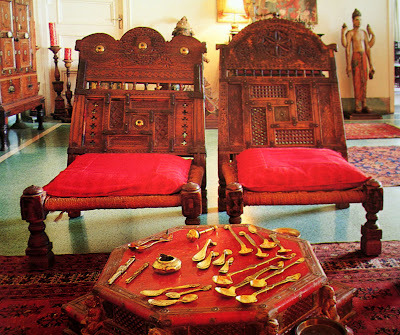 Chettinad style furniture from South India. 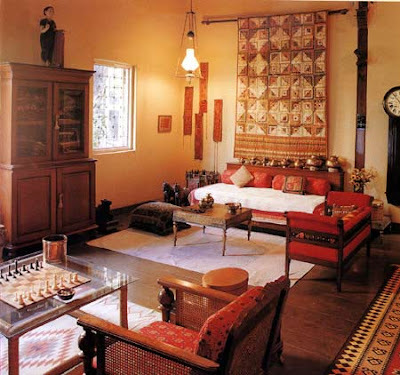 This eclectic piece from North India shows the mixing of Imperial, Empire & Indian style. Lovely wood and cane sofas with red cushions. 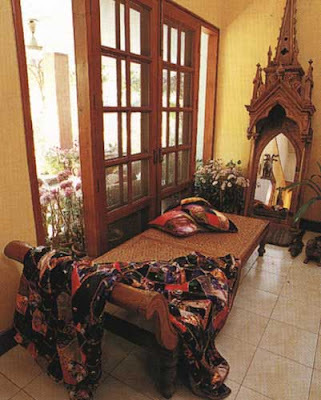 A caned daybed from Kerala placed between two open doorways provides a breezy resting spot. 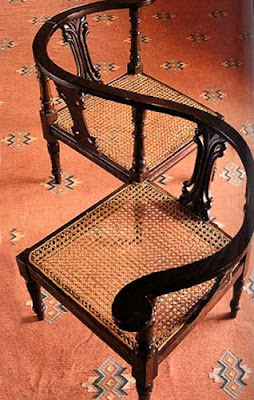 Look at this lovely 'Sociable' -this is a Victorian style furniture still found in some of the old colonial mansions in India. 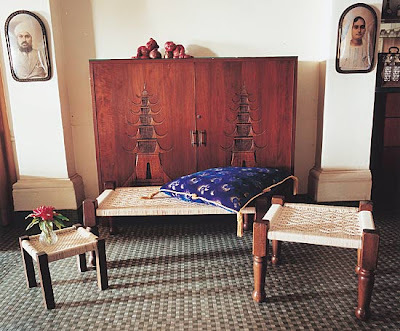 An old Goan wood & cane divan. 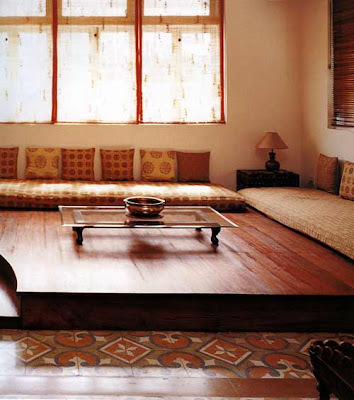 A Regency inspired Indian sofa made in Goa fills up an otherwise bare room. 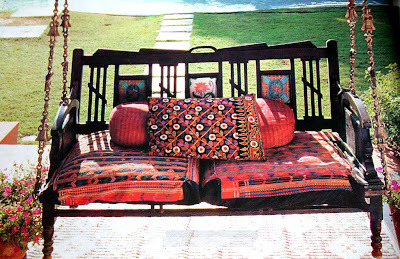 I Love Bhaitaks -A floor level seating arrangement that comprises of thick soft mattresses placed against walls and loads of decorative cushions & bolsters thrown in to at a burst of colours. 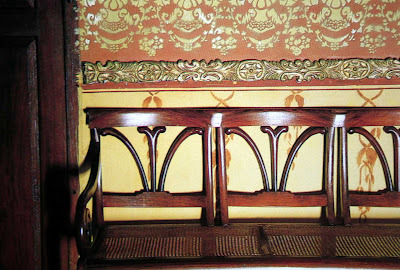 An Anglo-Indian influence in the form of a Victorian design settee. The humble Charpoy turned into a charming piece of furniture by Stringbedco, they make amazing charpoys with modern sensibilities. 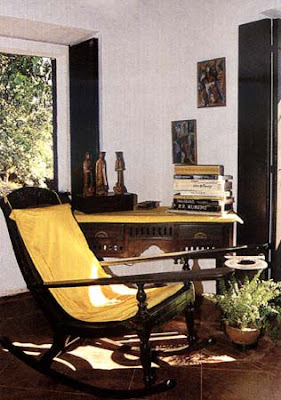 The Rattan chairs and settees are excellent for indoors as well as outdoors. Enjoy these while I curl up on my favourite sofa with a cup of chai. Yes, I am talking about 'Walls'. 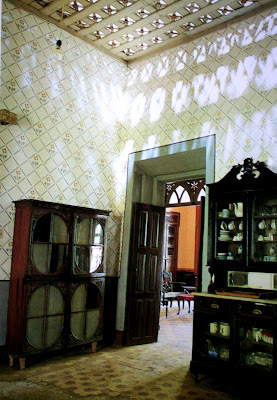 The terracotta and white decorative patterns are inspired by houses in Magh. 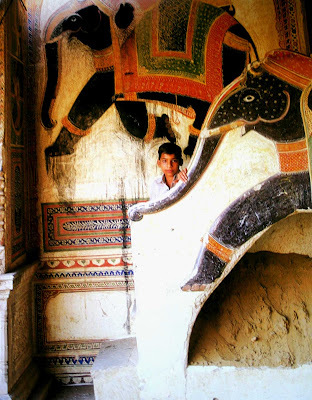 Gone are the days when walls were plain and their purpose was to house paintings, today they are the paintings. Bring in some rustic charm... 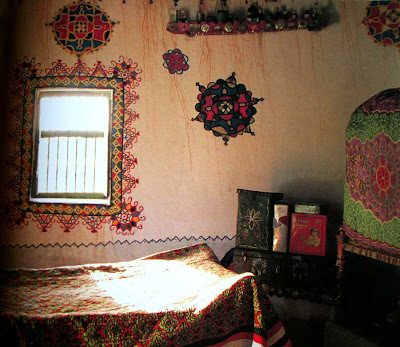 Traditional wall decorations painted by the caftsmen from the Wadha community, Hodka, Kutch. 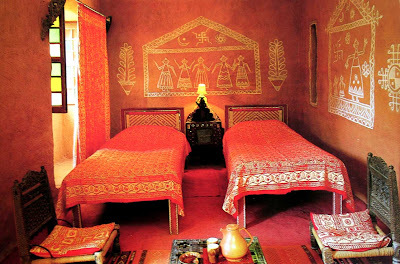 Interesting flat, stylised & geometric designs with birds & camel motifs painted on the outer walls in the villages of Baramsar & Roopsi, Kutch. (What a fantastic idea!) 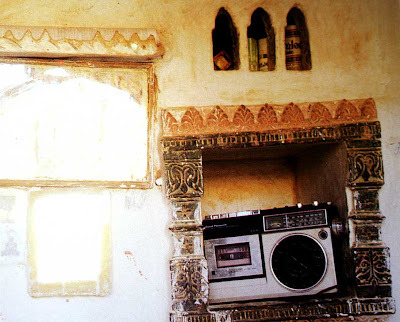 Terracotta tiles frame a niche in a house in Baramsar, Kutch where the cassette player is the only western amenity. 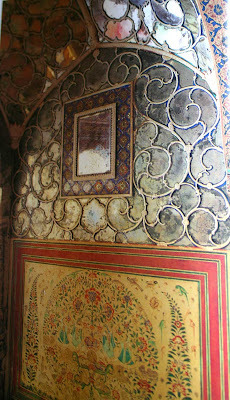 Inlay work with antique mirrors & stylised flowers in Samode Palace, Rajasthan. 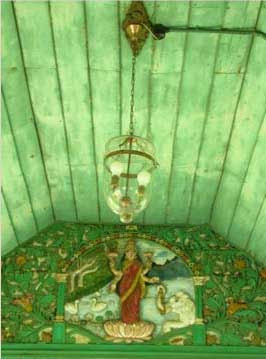 Lovely painted patterns in a private chapel in Goa. 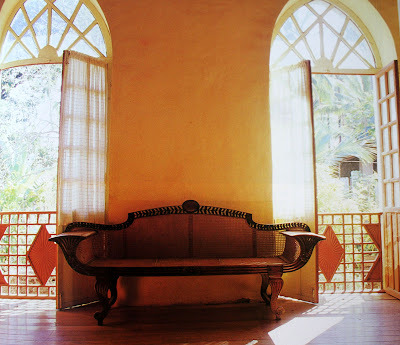 The trellised roof forms interesting shadows on stencilled walls in one of the homes in Goa. 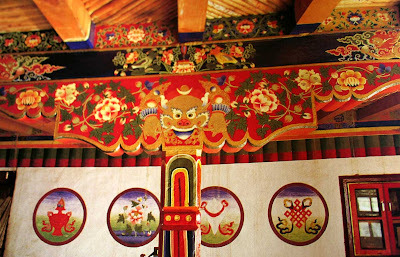 Colourful Buddhist motifs in the mountainous region of northern India. Or go contemporary/fusion with these design ideas... 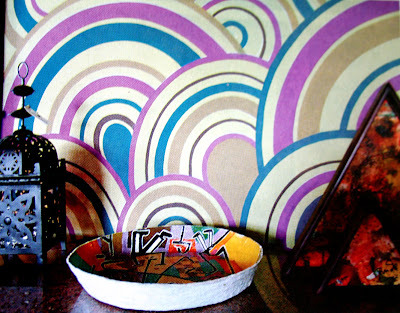 Bold colourful geometric patterns in Krsna Mehta's home. 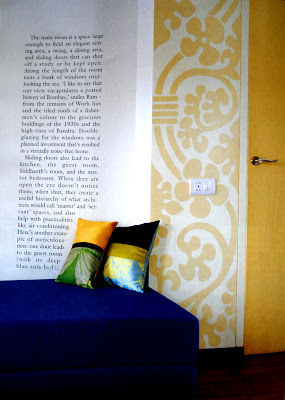 Goldpainted leaf motifs on blue background in Krsna Mehta's residence. 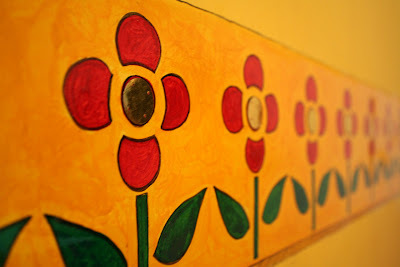 Free flowing hand-painted design in film-maker Ram Madhvani's home. 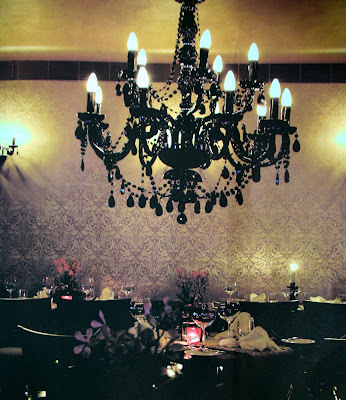 Feature wall with self gold floral print wall paper at Cafe' Penne designed by Payal Chopra. 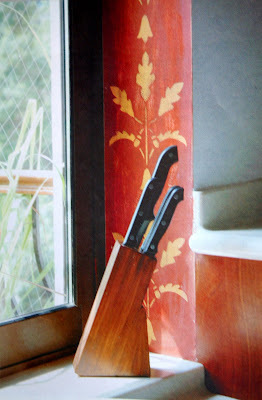 A sinuous bronze pattern on terracotta in Ram Madhvani's home. 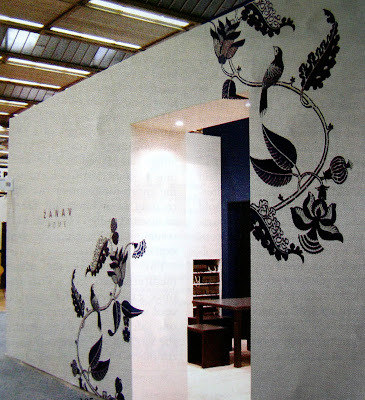 Foliage patterns in black & white designed by Tania Singh Khosla for Zanav Home. 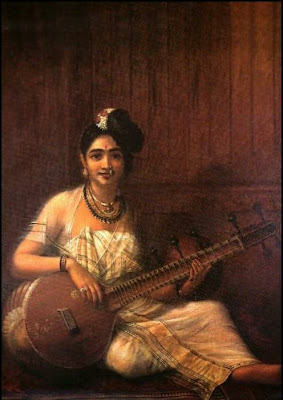 Everytime I look at Raja Ravi Varma's depiction of sari clad, graceful & beautiful Indian women, I gasp! 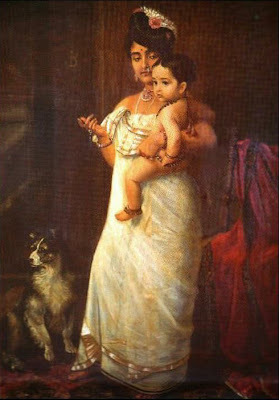 Raja Ravi Varma was an Indian king from Kerala who was also a great painter, during the 19th century. 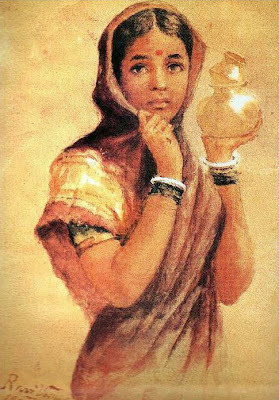 His paintings are considered to be a fusion of Indian traditions with European techniques. 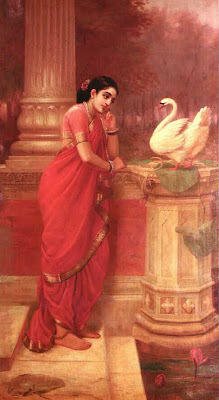 He is considered to be one of the finest painters in the history of Indian Art. 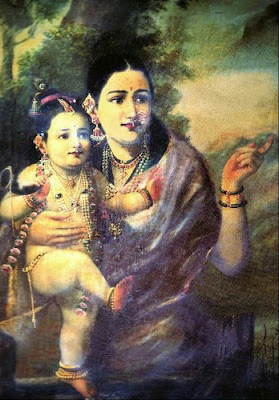 He is famous for his paintings depicting scenes from great epics like Mahabharata & Ramayana. 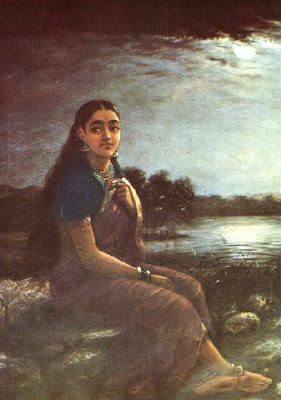 You can see more of Ravi Varma's prints & oleographs here. Blushing Pinks and Sparkling Silver this Diwali. I love to hear from you. 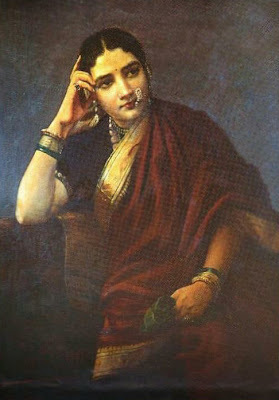 I try my best to reply to all your queries and emails, but if I am unable to respond please don't feel offended. 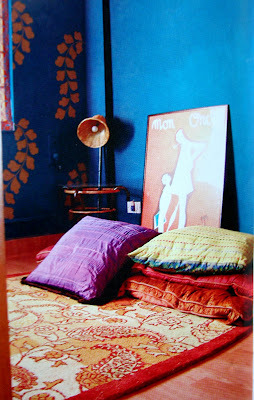 A creative space filled with inspirations on Indian & Global Interior Design, Decor, Lifestyle, Textiles, Art & Artists. 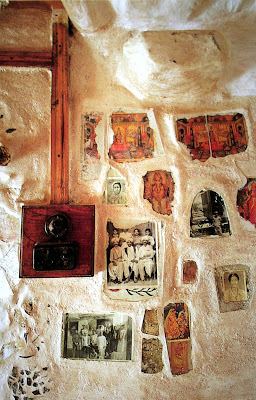 I share travel stories to off-beat locations, boutique hotels, quaint home-stays. 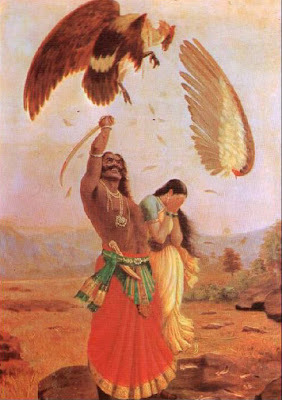 So, come enjoy one more 'Rang'(Colour) of my life! Spring is here to stay. 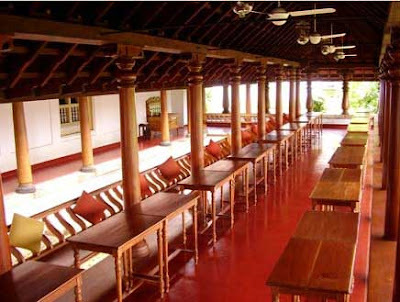 A unique heritage hotel- Sterling Swamimalai.